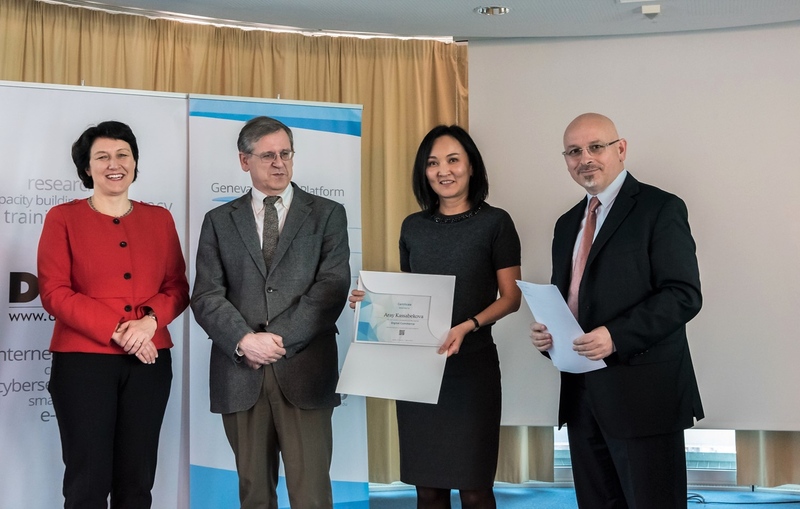 Geneva, Switzerland, 15 March 2018: Diplomats who completed the just-in-time course in Digital Commerce were awarded blockchain certificates in addition to the traditional certificate. The six-week Digital Commerce course for Geneva-based delegates of developing and least-developed countries was offered by DiploFoundation, CUTS International Geneva, the International Trade Centre (ITC), the Geneva Internet Platform, and delivered with the United Nations Conference on Trade and Development. It was funded by the UK Foreign & Commonwealth Office. Speaking during the ceremony, Ms Marion Jansen, Chief Economist of the International Trade Centre (ITC), said that an important objective of capacity development programmes was to help participants overcome their fear of unknown subjects, and of asking questions. Successful programmes are the ones that help participants lose their fears to ask the questions they need to answer in order to take informed decisions. Mr Rashid S. Kaukab, Executive Director, CUTS International Geneva, complimented the participants on their sustained engagement during the course, as well as their questions and observations that enriched the discussion. He was confident that the materials and lectures will remain relevant sources for them in their ongoing and future work. Mr Angel Gonzalez-Sanz, Chief of the Science, Technology and ICT Branch, Division on Technology and Logistics, UNCTAD, said that the knowledge gained from the course will help diplomats further interact and engage in upcoming digital trade-related discussions. Welcoming the course as a model for the Geneva Initiative on Capacity Development in Digital Policy, Mr Michael Kleiner, economic development officer, State of Geneva Directorate General for Economic Development, explained that capacity development in the field of digital policy can draw on the wide expertise available in Geneva. Prof. Jovan Kurbalija, Director of DiploFoundation and Head of the Geneva Internet Platform, who presided over the ceremony, stressed that the course contributed towards a more inclusive and informed debate on the future of digital commerce. An informed search for policy convergences is particularly important at a time where there are many divergent views on digital policy. The course covered a wide range of issues of relevance to current e-commerce discussions, with particular emphasis on the intersection between digital policy and trade. Participants had the opportunity to engage in the study of topics such as emerging online business models, e-payments, digital currencies, taxation, competition, cybersecurity, encryption, privacy and data protection, cross-border data flows, data localisation, regional trade agreements and multilateral discussions at the World Trade Organisation. The blended learning course format included weekly face-to-face meetings. The ceremony of delivery of certificates was preceded by a lecture on Blockchain technology and Bitcoin, delivered by Diplo’s cryptocurrency expert Mr Arvin Kamberi. At the end of the ceremony, certificates were delivered in traditional format as well as in digital format through blockchain, in order to provide an example of the use of this technology for authentication. Presenting the blockchain certificates to a graduate (from left): Ms Marion Jansen, Chief Economist of the International Trade Centre (ITC), Mr Angel Gonzalez-Sanz, Chief of the Science, Technology and ICT Branch, Division on Technology and Logistics, UNCTAD, and Prof. Jovan Kurbalija, director of DiploFoundation and head of the Geneva Internet Platform. Discussing state behaviour in cyberspace: What should we expect?